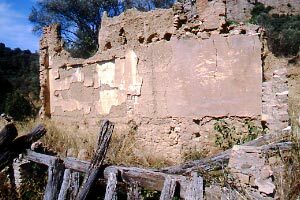 La Muela is a small nucleus in the Somontano de Barbastro. 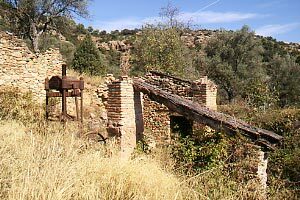 It belongs to the village of Naval (see Naval's mill) and nobody lives there permanently. 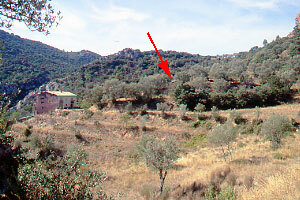 The easiest approach is not from Naval but from the East from the main road between L'Ainsa and Barbastro. 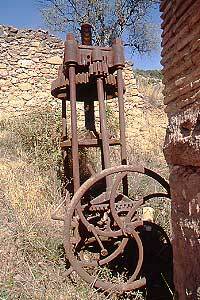 Coming from L'Ainsa drive until You pass Abizanda (see Abizanda's mill). 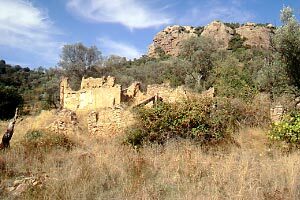 A short while further on a branch to the left leads to Mipanas (see Mipanas' mill). Then comes a rest site with panoramic view over the lake. The road goes over the top of the hill and turns rather sharply to the right. You are now near km 17. Where the road turns left is a dirt road running to the right into the hills. That's the one which will bring you to La Muela. Make sure you have enough clearance, or better still, walk the track. The site is situated halfway between Mipanas and Naval. Originally the mill and the house —completely renovated in 1999— formed one property but ownership was later split between heirs. The people living there at the time of our visit where direct descendants of the miller. During their childhood, we were told, they had assisted with the work at the mill. 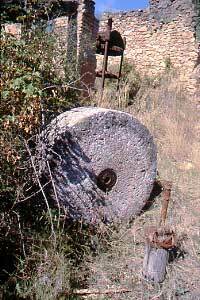 The mill was shut down shortly after the civil war. Looking at the ground-plan one can only conclude that the molino must have been quite important. I'm not sure about the purpose of the western part of the mill. Was it a warehouse with olives waiting for processing? 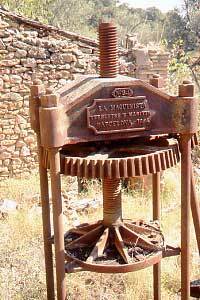 Was it a mill equiped with an oldstyle wooden press? Difficult to tell. 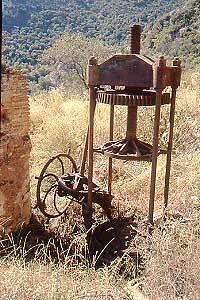 The eastern section housed an aceitero with a modern (for the time) vertical press. It's quite a contraption with impressive wheels and gears. A ruello severed from its axle stood hidden below bramble bush in a separate room nearby. 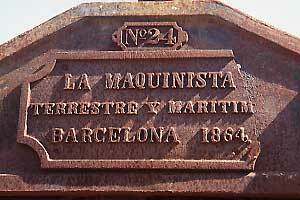 La Maquinista Terrestre y Maritima is a brand we've seen more than once. M ipanas , situado en la orilla del embalse de El Grado fue el medio de la nada. El nuevo compuesto de Rios a Barbastro Mipanas acercaba más al mundo civilizado. Aparcar el coche donde Mipanas indicó. Hay suficiente espacio al lado de los contenedores de basura.Ahora caminar por el camino de ripio hacia el pueblo. El molino es sólo un poco más. “Iba una vez un arriero con un burro, de esos que venden vajillas. Se le cayó el burro y él solo no podía cargarlo. Era noche de Todos los Santos, que dicen que se aparecen almas. De allí a poco rato empezaron a pasar lucetas y más lucetas mucho rato. Al final, pasaron dos a oscuras que le ayudaron a cargar. Esas lucetas eran almas que pasaban y las dos que le ayudaron le dijeron al hombre que fuera a cierta casa y dijera que hicieran fuego y quemaran cera por ellas ya que, como no lo hacían, esa era la razón por la que tenían que ir a oscuras”.